Since birth Id heard tales about Alexandria. This is where my parents called home. Some memories happy and others not so much..
We were told to be thankful that we did not have to grow up in poverty and were fortunate to live the life we lived. Nevertheless every Saturday regardless how they feel about each other both my parents route for the LSU Tigers and the New Orleans Saints on Sunday’s. Depending on the week you may even smell delicious gumbo coming from the kitchen. Although My fathers father died When I was just 2 and a half, I’d always known he was very smart and I found out sometime last winter he even attended college in Arkansas where he was raised. 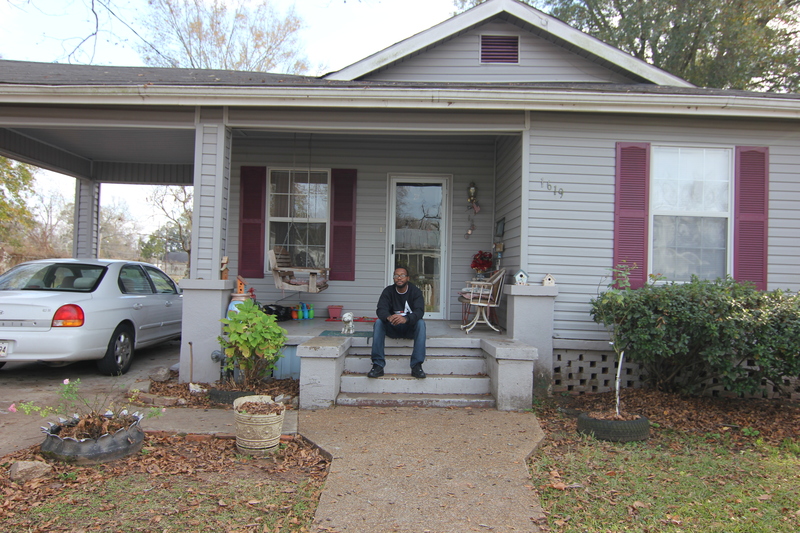 Last year I was able to visit my uncle in Angola for the first time ever, and my brother hosted this thanksgiving in New Orleans. Just 2 weeks later my lovely girlfriend and I would come back to New Orleans to celebrate her birthday for an entire week. While we did everything from eat binese and po boys to go on a swamp tour, have lunch with a friend whom we randomly ran into on the flight down, to the French quarters market, burbon street, and the river walk; our 3 hours each way road trip to Alexandria louisiana was by far my favorite part of the trip. We’d stop in opololusus to buy boudan while discussing life and our future. I also wanted to show Diana where my family had started and properly introduce granny to the young woman I love dearly. We’d get to Alexandria around 1 and Id first meet my fathers oldest sister aunt glen standing in the door way. I’d have to go next door to meet granny at the church where she was assisting them in wrapping up a fundraiser where they’d been selling gumbo all morning. I’d notice folks under what my father refers to as “the tree”. 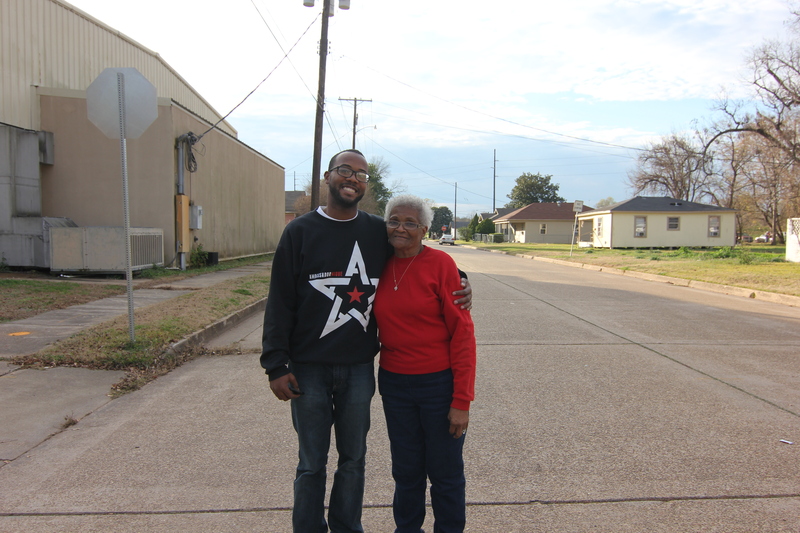 We’d meet my grandmother in the middle of the crossings of 17th and Reed. She’d point out that this was the same block that she’d been born and raised. She told us stories of how my grandfather moved back with her after she had gotten sick and they’d raise their kids here. She’d point out the four churches in a one block radius, abandon houses and some history of the neighborhood. Diana and I would later talk to my uncle and look through pictures my grandmother had gotten out for us. I’d also have the opportunity to interview her on camera and ask her about her childhood and upbringing. On our way back to New Orleans that night I began to think about the importance of community. No matter how much money you have or where you live, our participation in our community can be vital to our survival. 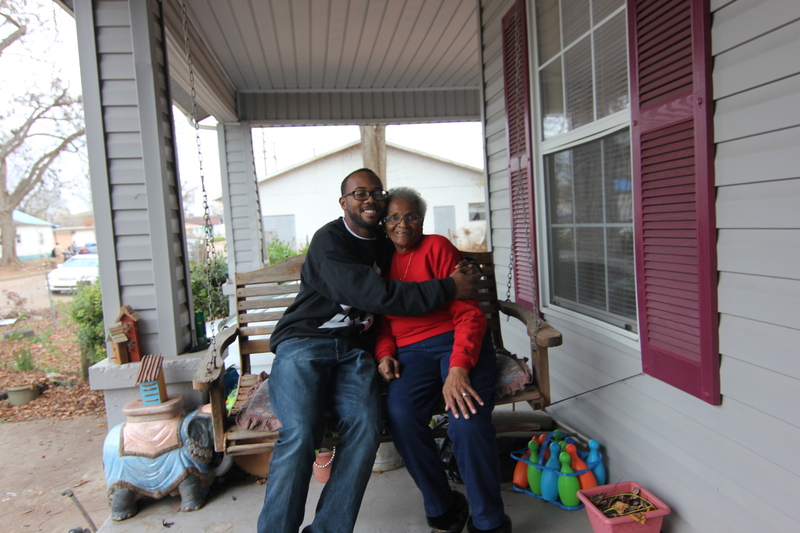 My grandmother stays in Alexandria because she feels important to that community. I am thankful to have her and I am thankful for her acceptance of Diana and our relationship. Love is love. This entry was posted in All Writings, Blog, Written By AmbassadorNique and tagged age, alexandria, ambassador, AmbassadorNique, community, grandma, interview, life, louisiana, love, new, Nique, orleans, Productions, travel, weekend, wisdom. Bookmark the permalink. The crazy part is I’m so proud of this guy and the fact that he actually saved the lives of these women. While the media will either ignore his efforts or try to make a mockery of his bravery I appreciate him telling his truth. We are who we are and as he stated in his interview he is an American just like most of us who live in this country. I guess mainstream America expects us to all suddenly change who we are and become politically correct when camera’s come on, unfortunately most of us actually try. I was a bit disappointed when I turned on Democracy Now yesterday and Charles wasn’t even mentioned in the story, nor was he given credit on many other news outlets. Its hard for me to not think that race didn’t have something to do with it. If put in the same situation, what would you do? This entry was posted in Blog and tagged 360, anderson, charles, day, heroic, interview, ramsey. Bookmark the permalink. Continuing with my interview here is another question I was asked to answer. I believe the biggest barrier I’ve faced was the fear of being afraid of taking advantage of greater opportunities. Yes, there are many opportunities that I’ve either missed or did not have, but too often people of color are told we “can’t” do something or that we are not “supposed” be doing certain things that may require a higher skill level. Unfortunately these barriers to often come from people who look exactly like ourselves. Furthermore the minute one tries to achieve what has not been done or collaborate with someone outside their race they are labeled sell outs. Is it jealousy or are people just afraid to see others succeed? Too often we place people of color in boxes based on their skin color and environment and limit their growth, putting a ceiling on what should be a stepping stone. I’ve personally stood on both sides of this oppression being the victim and oppressor. At the age of 25 I am trying to do everything that I can to educate my own ignorance as well as do everything I was told I would not be good at. I am working hard to understand the intentions and motives behind what I do not understand. I am working to change my eating habits, continuing my education and bringing myself and my race to new places with the confidence that I did not have when I was younger. Unfortunately the support still isn’t where it should be, but one must start with the man in the mirror and hope that those who still carry ignorance will change. This entry was posted in All Writings, Blog, Written By AmbassadorNique and tagged ambassador, barrier, color, councilor, identity, information, interview, Nique, Productions, succeed, success. Bookmark the permalink.